Oppostion Terms Budget 2018-19 "Defeatist, Rhetoric"
Terming the budget as a "big disappointment", former finance minister and senior Congress leader P Chidambaram said it showed the government has thrown in the towel and conceded that it has failed to address key issues in economy. Narsinghpur: "Defeatist", "big let-down" and "rhetoric" was how the Congress and Left parties described the Union Budget 2018-19, stating that it failed to address the key concerns relating to the economy and that the promises have remained unfulfilled. 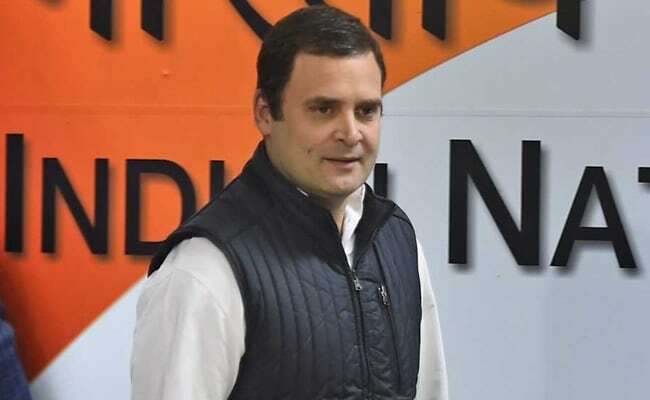 Leading the opposition's attack, Congress president Rahul Gandhi said sarcastically "thankfully only one year of the Modi government is left" as he hit out at the government on issues concerning farmers and youths. "4 years gone; still promising FARMERS a fair price. 4 years gone; FANCY SCHEMES, with NO matching budgets. 4 years gone; no JOBS for our YOUTH. Thankfully, only 1 more year to go. Budget2018," he said on Twitter. The budget proposals should have been "bold and radical", he said. "It is a defeatist budget. I think they have thrown in the towel. They have run out of ideas...they have run out of gas. It is just words, it is the defeatist budget; it is a budget of a government which has conceded that it has failed to address important issues in the last three years," he said. Mr Chidambaram also picked holes in the government's budgetary promise of providing insurance coverage of up to Rs 5 lakh to 10 crore poor families and said it was a "big jumla" (gimmick). "The finance minister fails the fiscal consolidation test and this failure will have serious consequences," Mr Chidambaram told PTI, soon after Union Finance Minister Arun Jaitley completed his budget speech. Joining the bandwagon, CPI(M) leader Mohd Salim alleged that the last full-fledged budget presented by the BJP-led NDA government was worked out eyeing the Lok Sabha elections to be held next year. "It is a campaign for them. We consider it as a 'big jumla'. We think it is an election campaign as talks are going on for early elections," he told reporters in New Delhi. Trinamool Congress (TMC) leader Derek O'Brien termed the budget "super flop" and a "dying declaration" of a government whose "time is up". CPI leader D Raja said the budget shows "desperate attempts of the government to hoodwink people in 2018", in which several state polls will take place and "probably the Lok Sabha polls too". "It is not a growth-oriented budget. There is no certain attempt for employment generation. The government has talked about doubling the farmer's income, but for that the agricultural growth should increase up to 12 per cent. That is not there," he said.